How to Make Money Using Intraday Trading? Intraday trading is an interesting way to make money in the stock market for a lot of people. Quick results and immediate pay-outs may make it sound promising, but there are risks too associated with it. Intraday trading is an interesting way to make money in the stock market for a lot of people. Quick results and immediate pay-outs may make it sound promising, but there are risks too associated with it. You need to follow the stock market movement closely to get it right in addition to many other things. 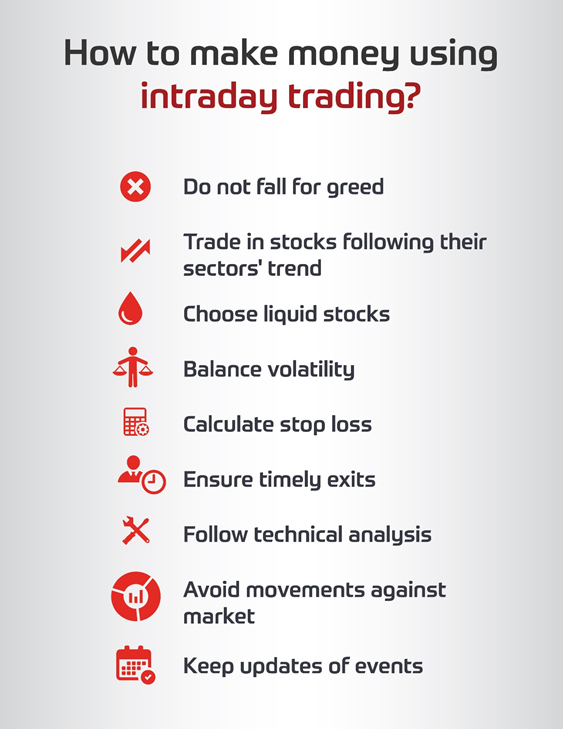 If you want to do intraday trading to make money, here a few things that you should keep in mind. • Do Not Fall For Greed: Greed is the biggest trap in which most of the investors fall and end up losing their money. If you do not want the same to happen to you, it is very important that you should never fall for greed. It is greed to earn more profit which makes you hold the position causing loss eventually, as in most of the cases. • Develop Habit Of Quick And Diligent Decision Making: As the time frame of an intraday trade is short and fluctuations happen very rapidly, it requires you take decisions quickly. Not just quick but a diligent decision making helps you to make a successful trade. • Trade In Stocks Following Their Sectors’ Trend: Predictability is seen very less in intraday trading. To understand the trend of a whole sector is much easy than a single stock. Thus, to make a right decision by having a higher predictability, it is important that you choose stocks which follow their respective sectors’ trend. This decreases the chances of losing money. • Choose Liquid Stocks: Stocks which are liquid are easy to square-off before the day ends. Also, it is easy to buy and sells more units of liquid stocks to book better profit. • Balance Volatility: At the same time, it is crucial that you balance volatility. A stock with a very low volatility will not have any significant price change thereby could only result in negligible profits, even after buying more shares. While at the same time if the stock is highly volatile, it has steep fluctuations, which mean higher risk involved and more chances of incurring losses. • Calculate Stop Loss: Calculating stop loss is very important if you want to avoid making losses. It would help you to get the right exit point when the trend reverses. • Ensure Timely Exits: A timely exit can ensure due profit booking and can save you from incurring losses. • Follow Technical Analysis: Technical analysis helps you in predicting the price movement of the stock based on the calculations, charts, and history. • Avoid Movement Against Markets: Most of the stocks largely follow the market trend, where most of the stocks’ prices could be seen falling during a falling market. Until there is a strong research-based analysis backing your movement against markets, doing it is not favourable most of the times. • Keep Updates of Events: Price of stocks depends on the market, economic and socio-political events. Thus, keeping an eye on them will help you understand the causes behind the fluctuations and enable you to take better decisions after due analysis. If you are looking forward to following the above-mentioned tips, then you brighten your chances of becoming a successful trader and making money in the stock market.